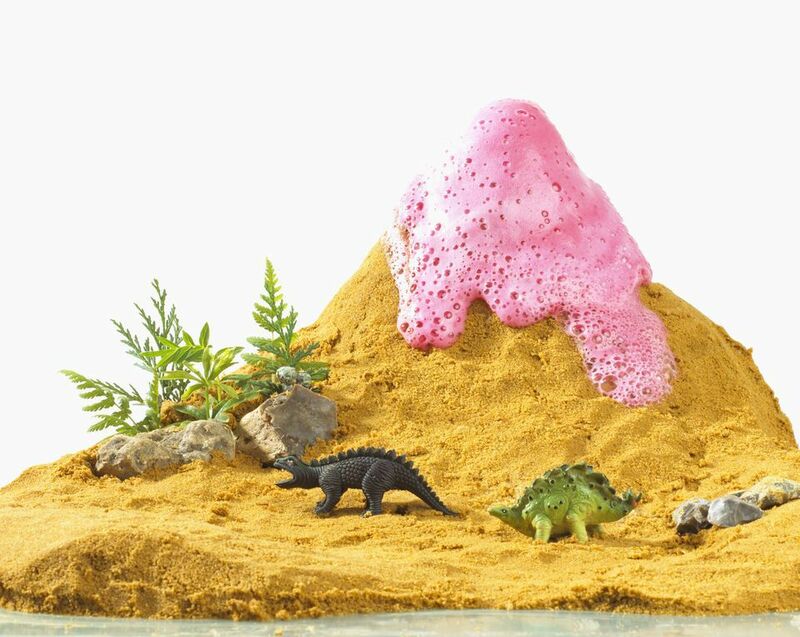 You can make your own miniature volcano that will actually erupt! This is a fun and instructional lesson in chemical reactions. It's a small volcano, but its eruption will still be grand. If you want a bigger volcano, you can use a 2-liter bottle and make a paper mache mountain. When you are ready for your volcano to erupt, take it outside or put it in a well-protected area as it will be messy. Attach the disposable cup to the center of the paper plate with the masking tape. Use clay to form a mountain on the plate around the cup. You can either buy clay or mix up a batch using one of these recipes. Your mountain should completely cover the side of the cup. The hole in the cup will be the crater where the lava comes out, so be careful to not get any clay in it. You may want to let the clay dry, but it's not necessary. Once your mountain is ready, prepare for your eruption. First, measure the water into your volcano crater. Add 3 to 4 drops of dish washing soap and 3 to 4 drops of food coloring. Stir in the baking soda. Pour some vinegar into the other small disposable cup so the cup is about 1/3 full. Quickly pour the vinegar into your volcano crater, step back, and watch your volcano's bubbly eruption! The word volcano was originally derived the name of the Roman god of fire, Vulcan. Volcanoes are actually openings in the earth’s surface. They release ash, gas and hot magma and the eruptions can be an incredible site. Hot liquid rock that sits under the earth’s surface is called magma; when it is released from the volcano it is then called lava. Earth has some very large volcanoes, but the biggest one in our solar system is actually on Mars! It's called Olympus Mons and it's 373 miles wide and 13 miles high! Jupiter has the most volcanic activity in our solar system. The planet is covered in volcanoes, and the surface of the planet is always changing given the constant volcanic activity. Ash can shoot 17 miles into the air with a volcanic eruption on Earth. You might think of volanoes as having a cone shape like a mountain, but there are other types that look like wide plateaus and bulging domes. There are about 1,510 active volcanoes in the world and 80 or more which are located under the oceans. The crust of the earth (the part we live on which is 18 miles thick) is comprised of huge slabs called plates which sometimes move. When two plates collide, one section slides over the top of the other and magma is squeezed up in between the two. Fresh lava ranges from 1,300 to 2,200 degrees F and it glows red and white in the heat.